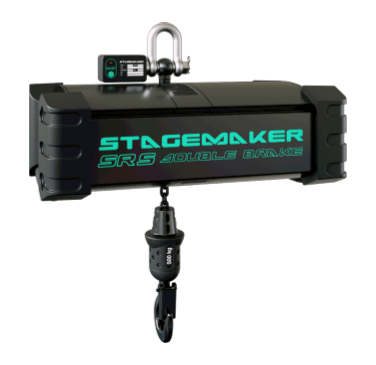 The Stagemaker SR Entertainment Hoist has been innovatively designed with all the latest technology. 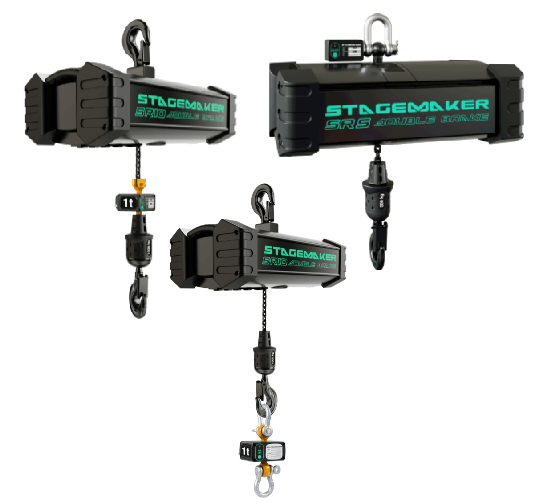 One of the biggest benefits of Stagemaker SR entertainment hoist is that it can be used in two different configurations. The standard industrial position with the main body upwards. In this configuration the load attaches to the lower hook and is raised and lowered on the chain with the main body remaining stationary. In the second configuration the main body of the hoist is in a downward position (upside down). This is often called a climbing hoist. The hoist is mounted/anchored with its load chain and the hoist body / hook attaches to the load. Therefore the whole body of the hoist is raised and lowered along with the load. Climbing hoists are often easier for installation purposes. 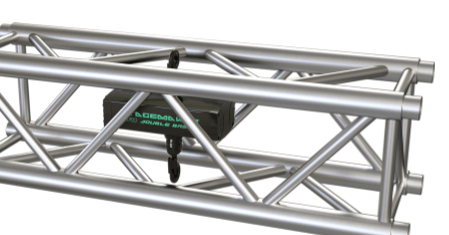 Another key benefit to using a Verlinde Stagemaker SR entertainment hoist is the safety aspect. These hoists incorporate an unprecedented double lifting brake system as standard to ensure the load is always held. What’s more the position of the clutch, which is in the reducer, ensures the brake stays engaged, guaranteeing the load is always held firm. 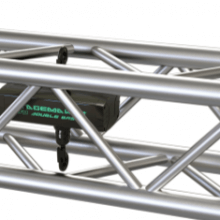 The SR entertainment hoist incorporates no less than three new innovative components. The ‘perfect push’ greatly improves chain flow. It also reduces the risk of the chain becoming jammed. The 5 pocket load wheel with five intermediate teeth are responsible for this chain movement. The ‘chain flux’ is made in aluminium for high strength. It allows the chain to flow smoothly into the chain bag whilst reducing jamming risks. It also enables horizontal flow as the chain comes off the load wheel. The chain flux design also incorporates a drainage system to minimise water collection within the load wheel area. The ‘Limit flux’ is basically a limit switch. On this model it has been built into the chainflux. 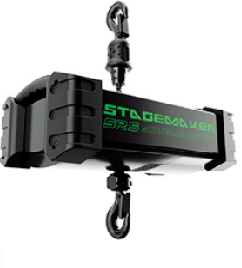 This enables greater control and precision when setting the hoist in any configuration. The limit switch operates via an upper and lower magnetic ring which is easy to move along the chain. 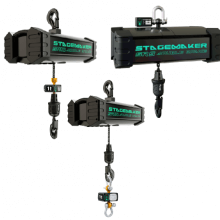 The streamlined, ergonomically improved design of Stagemaker hoists along with their robust stature and high end technology, makes them perfect for use within the entertainment industry. Being powder coated in black epoxy paint they perform very well in more extreme temperatures (-20 to +50 degrees c). They integrate well into theatre rigging operations. The gripping surface of the lifting hook is ergonomically designed and rubber coated. The rubber coated hand grips enable easier handling. With the operating sound level down to just 60db it is quieter than other hoists. Maintenance of the SR stage hoist is relatively simple. With easy access to fuses, torque limiter and plug & play electric boards. Visual access to the brake system for control and an easy to dismount motor further enhance the ease of maintenance. A chaining tool is included along with a high grade, removable chain container. 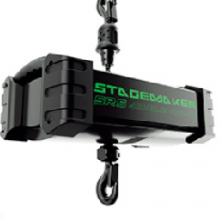 The SR stage hoist is available in 2 variations. Version A with 3 phase and direct voltage control.Version B is a 3 phase hoist with low voltage control. 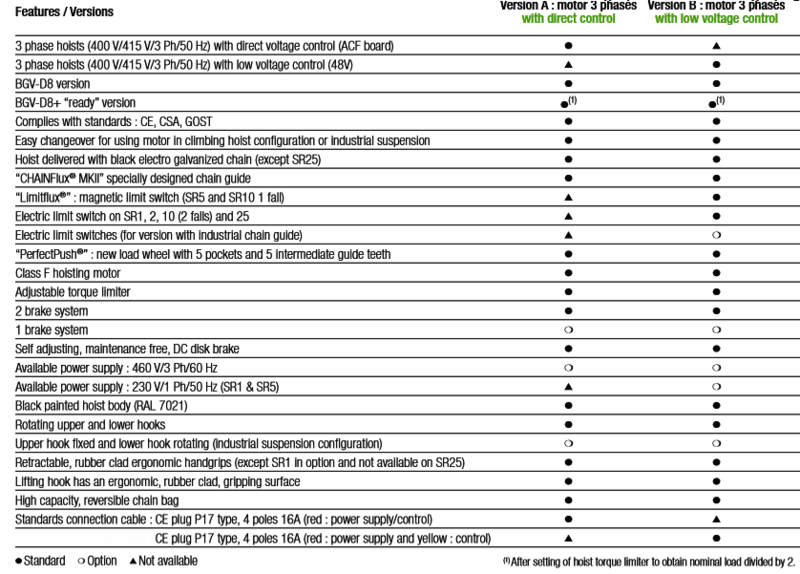 Please refer to the technical specifications tab to view the details. Here you will also find detailed information on each of the 12 models available. They have lifting capacities ranging from 125kg up to 5000kg. 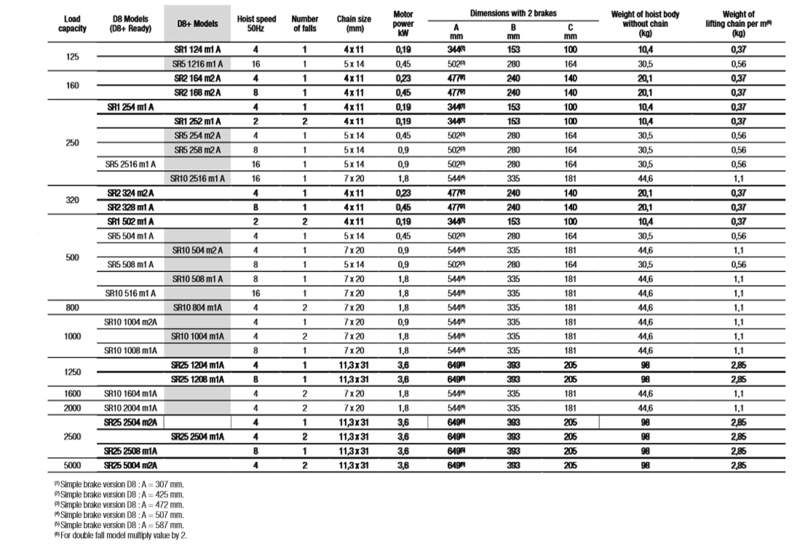 The sizes and measurements can be viewed on the dimensions tab. There are other complimentary products available as shown on the main Stagemaker Hoist page (view here) including, cases, load cells, 3 types of controllers (eco; rigger & theatre) and cable guides.